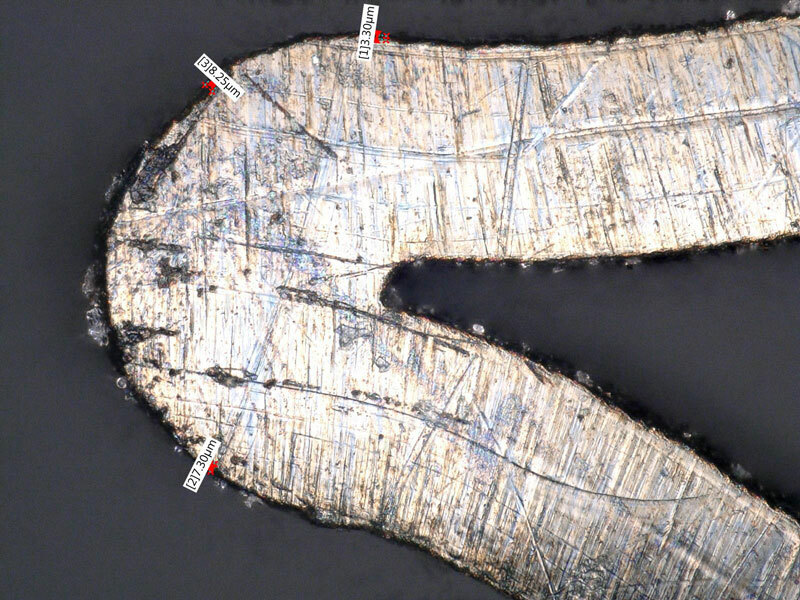 A well-directed blast of 17.5-micron aluminum oxide at 90 psi can remove oxide layers, smooth surface defects, and improve surface quality on a peripheral stent. 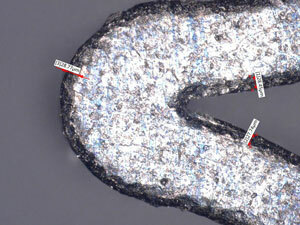 The damaged regions of a stent are brittle, but the base material, Nitinol, is ductile. Aluminum oxide preferentially attacks the brittle regions with minimal erosion to the ductile base, creating a uniform surface finish along the entire length of the stent strut. 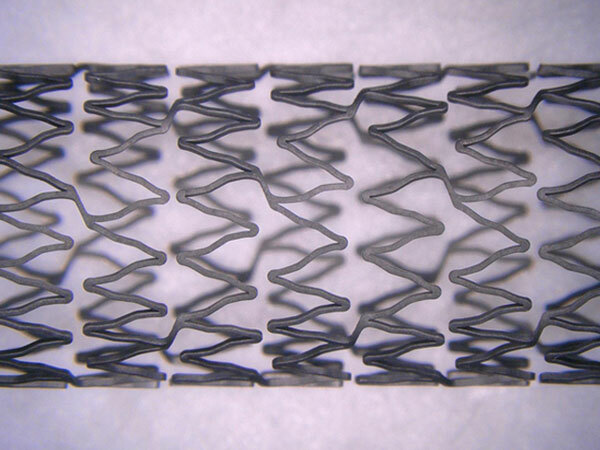 This approach to stent surface engineering has been a standard in the industry since the mid-1990s. First: why use MicroBlasting at all? Thanks to its inherent precision, medical manufacturers rely on MicroBlasting to prepare stent surfaces for electropolishing. 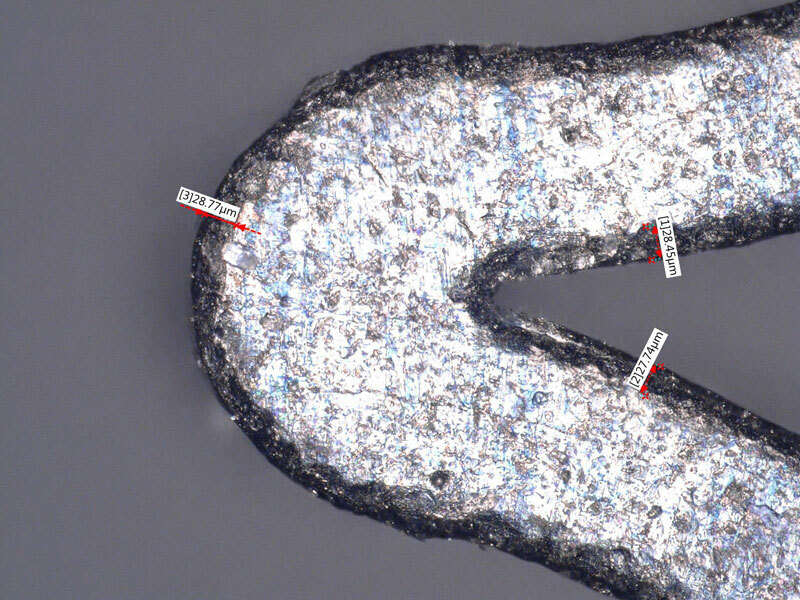 The OD surface of a stent tends to sustain little damage during manufacturing compared to the interior cut edges, which endure significant damage like dross accumulation, remelt, oxide generation, and heat-affected zones. 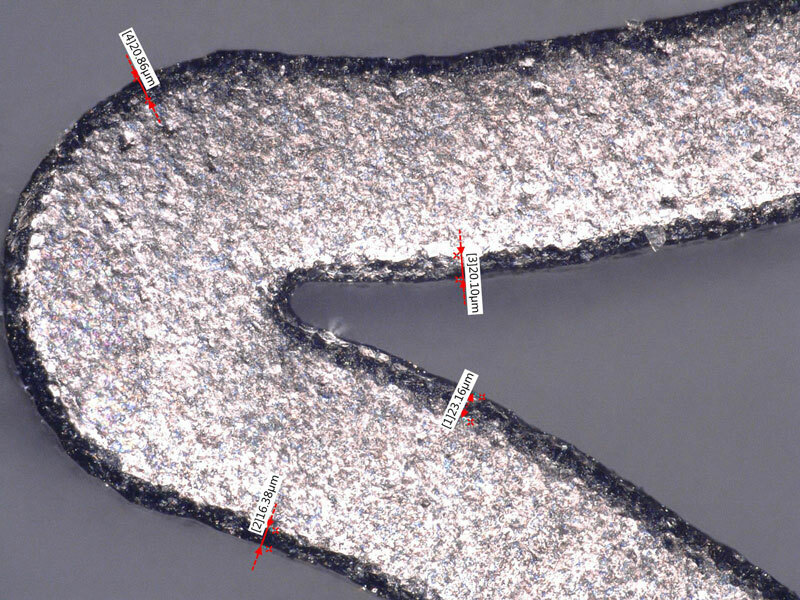 Our automated systems can direct individual abrasive streams to target the sidewalls of a stent with reduced impact to the OD surface. 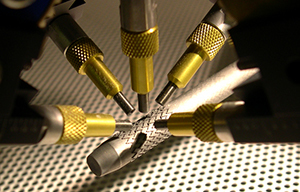 More recent stent designs and medical implants require greater edge-rounding. 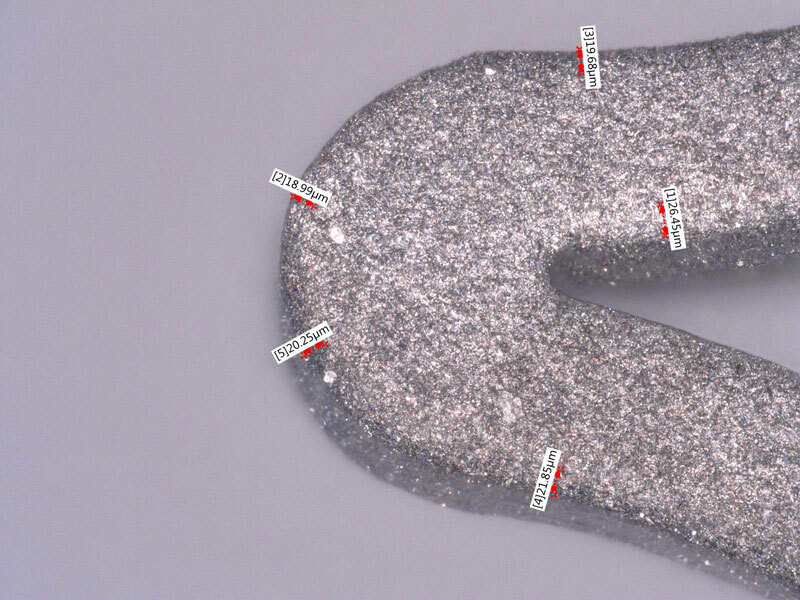 Round edges decrease the likelihood of catching, snagging, and other risks associated with implantation. 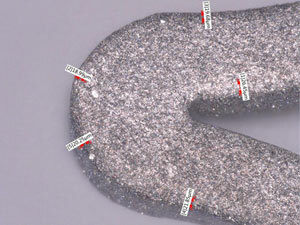 MicroBlasting with aluminum oxide produces a 5-15 µm radius, but the new geometries are specified closer to 25 µm. This radius can be achieved through three avenues: extending the blast cycle, using a larger size of aluminum oxide, or using a different abrasive altogether. Through testing, we learned that a longer blast cycle leads to more mass removal, and a larger size of aluminum oxide creates a surface that is too rough to polish. After all, an aluminum oxide particle is blocky in shape with slightly sharp edges. That left us with a single viable option: try a different type of abrasive. 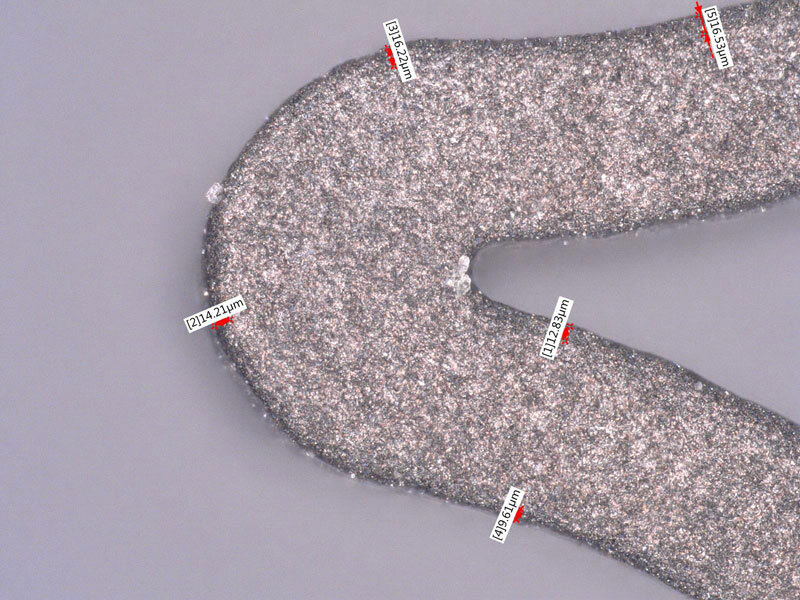 Determined to overcome this hurdle, we tested several types of media and found that blasting with glass bead creates the desired radius at the corners—up to 30 µm–without removing additional mass from the device. The result is a tenfold improvement from aluminum oxide. The samples below illustrate the difference in outcomes. 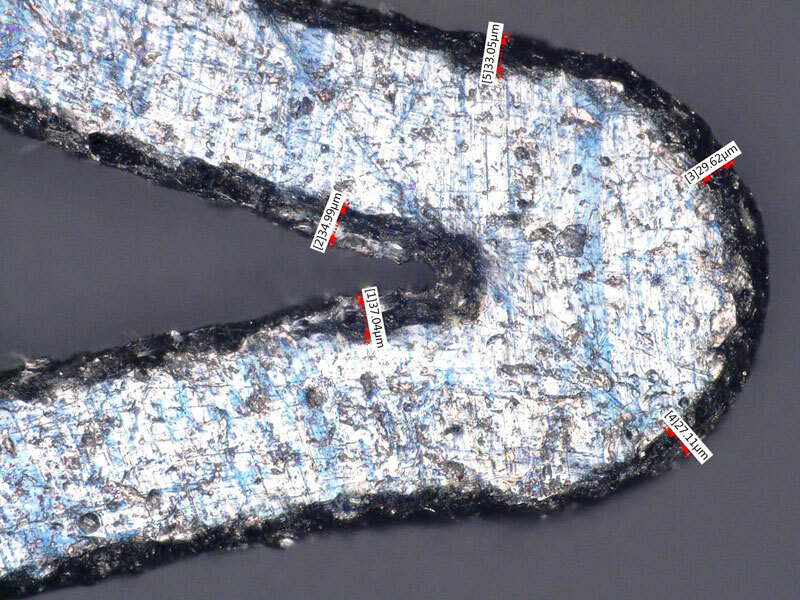 The radii on the sample blasted with aluminum oxide is just 8-13 µm, whereas the radii on the sample blasted with glass bead is 24-30 µm. 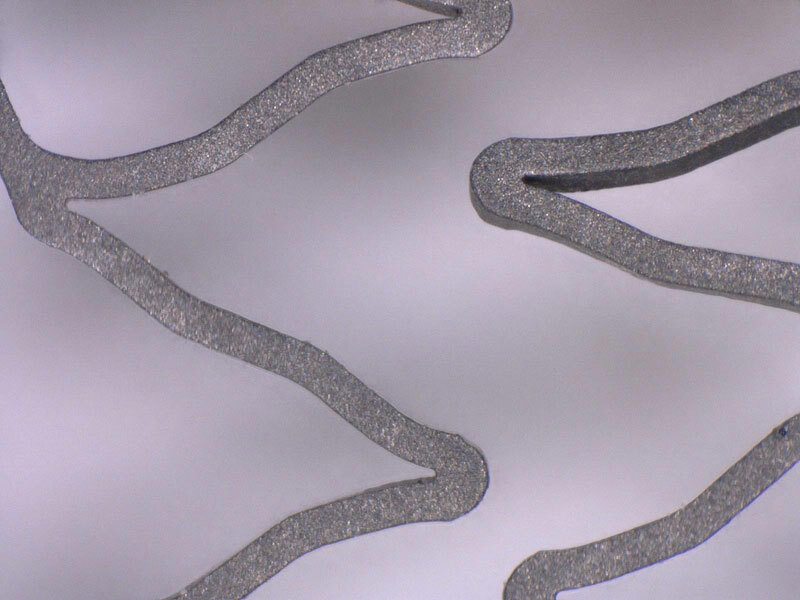 Stent surface (500x) after 17.5 µ aluminum oxide only. 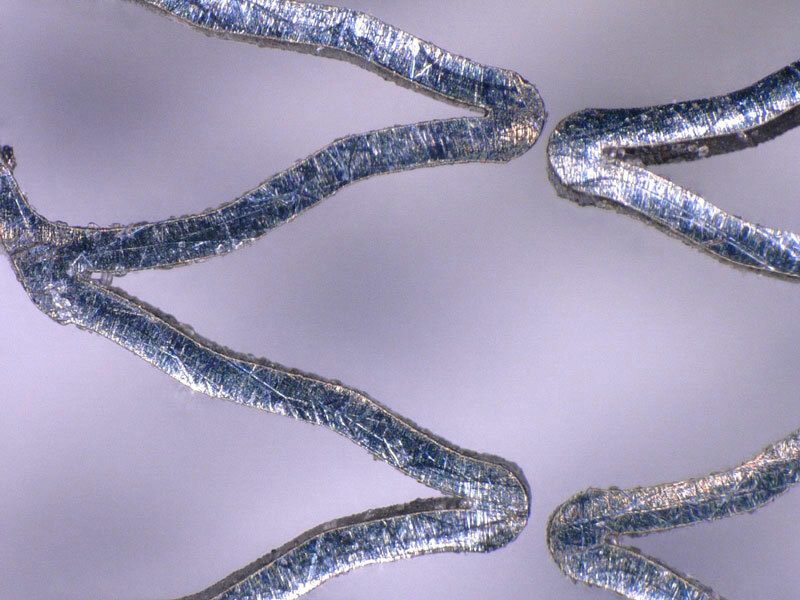 Stent surface (500x) after 100 µ glass bead, followed by 17.5 µ aluminum oxide. A radius can be achieved on the OD and ID corners with minimal additional material removal. The size of the radius can be effectively controlled because it is based on the size and velocity of the rounding abrasive, glass bead. 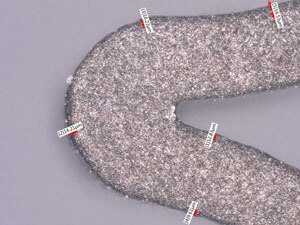 It is possible to control the regions of a stent that have the additional radius applied. 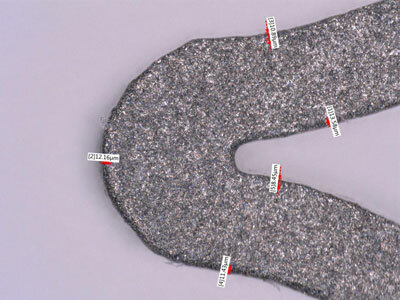 It helps to maintain the fatigue life of the stent by mechanically working the surface. 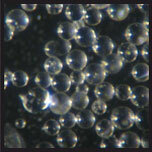 Glass bead abrasive is often used in peening applications where tight tolerances must be preserved. Glass bead peens the stent surface and removes no material or a negligible amount of material. As you can see below, the size of the glass bead is important: the larger the size of the glass bead, the rounder the edges. Glass bead is available in 35 µ, 50 µ, and 100 µ. Let’s look at the results from sample tests using each size. The unblasted stent surface (500x) pictured here has sharp edges and damage from manufacturing. 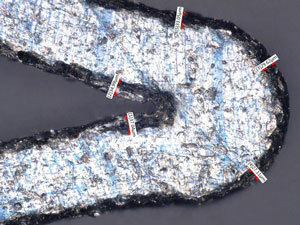 The radii range is just 3-8 µm. Why is 2 better than 1? Glass bead cannot remove dross, remelt and other damage created during manufacturing; only aluminum oxide can. Aluminum oxide cannot produce a truly round edge; however, it does create the ideal surface finish needed for electropolishing. One cannot replace the other. 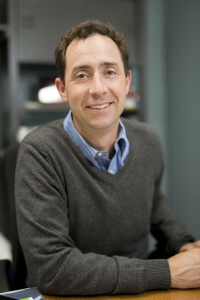 By using a multi-step process, the implant surface gets the best of both worlds with the same proven equipment. Adding a second abrasive to the process may sound more labor intensive, but it is actually more efficient than other edge-rounding processes. 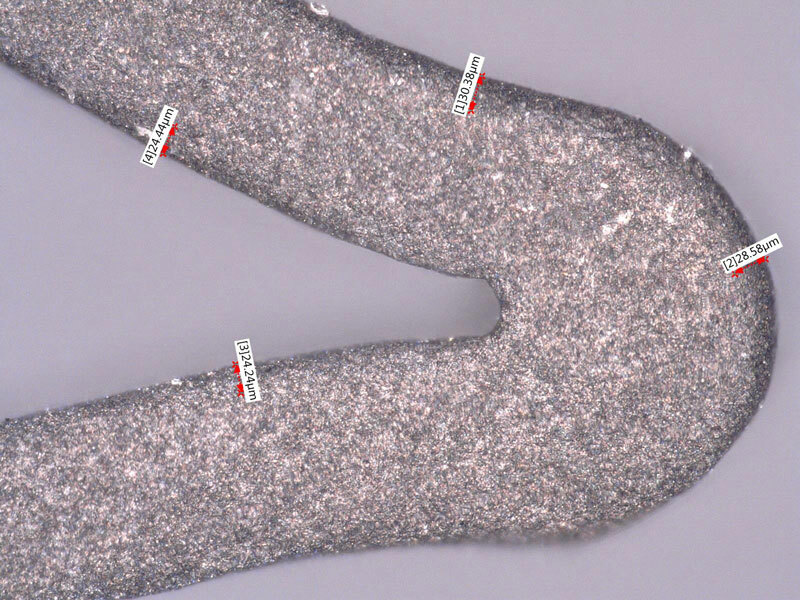 For instance, electropolishing can create a large radius, but it also removes too much material from the entire part, not just the corners, thereby compromising the fatigue life of the stent. We recommend blasting in the following order using an Advanced Lathe LA3250 Automated MicroBlasting System. To eliminate the downtime needed for abrasive changes, run two blasters, each with a single abrasive. Our new AutoChanger feature allows the program to switch between multiple abrasives and blast through the same nozzles. 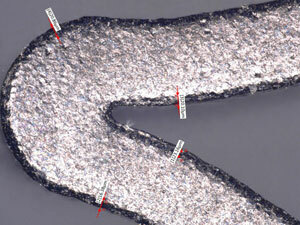 In our sample test, we determined that glass bead provides an edge radius on Nitinol devices that meets specification. Glass bead works in combination with the aluminum oxide to provide the ideal surface finish needed for electropolishing. The addition of a second abrasive to an already proven process is more efficient and an easier adjustment than adding a different solution altogether.